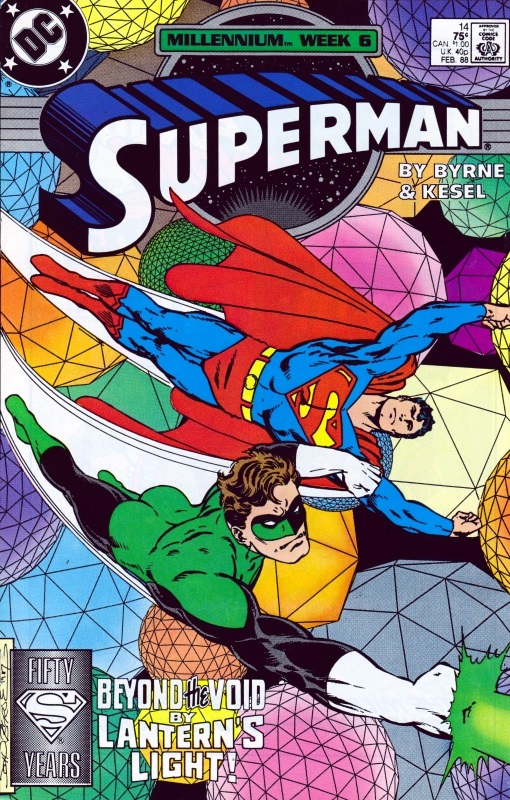 Following the events of MILLENNIUM #6, Superman and Green Lantern are tracking the Highmaster, leader of the Manhunters, who is heading to the dimension where the Guardians and Zamarons have been living since they left the universe to procreate, in order to kill them. They find a massive platform that was created by the Guardians and Zamarons but are attacked by the Highmaster, Superman tricked into burrowing in circles beneath the surface, while the Highmaster attacks Green Lantern. When Lantern summons the Guardians and Zamarons, he realises the Highmaster had used him as bait to find the immortals; with the aid of the Guardians and Superman, however, Green Lantern is able to finally destroy the Highmaster. 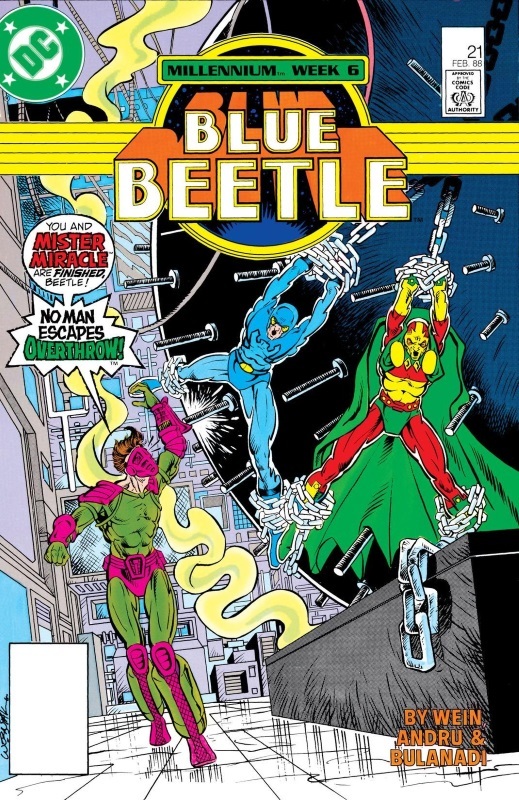 Blue Beetle and Mr Miracle head to Kord Industries where Beetle has a vehicle that can be modified to take the heroes to the Earth’s core where the remaining Manhunters are based, as they discovered in MILLENNIUM #6. 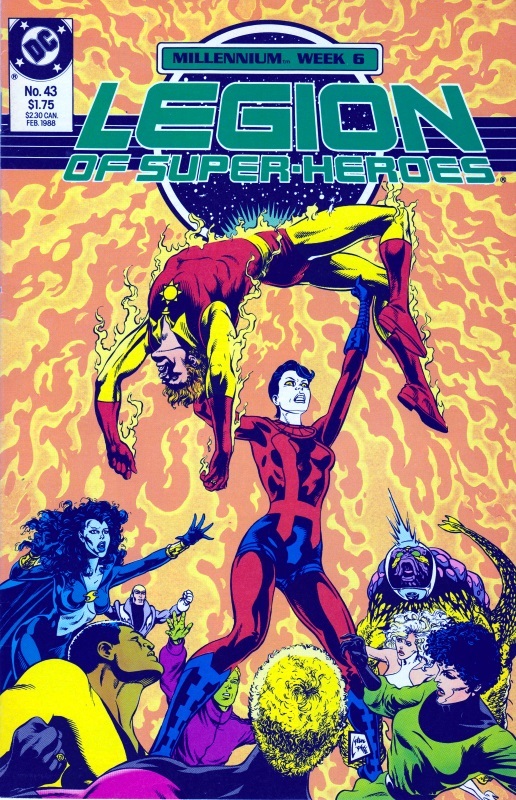 They are attacked by long time Beetle foe, and Manhunter agent, Overthrow, who is accompanied by Manhunters; defeating the heroes, Overthrow places them within the vehicle, but outside the safe command core, and sets it in motion, expecting them to burn up as the vehicles heads deeper into the Earth. The heroes escape, however, and recover the vehicle before defeating Overthrow. The Legionnaires dig themselves out from the ruins of the temple their previous team mate, Laurel Kent, buried them under in LEGION OF SUPER-HEROES #42 (show in Crossovers Week 2) and set about trying to find her. Having determined that the immortals – the Chosen – would be found in the Grand Canyon, Laurel heads there where the Legion attack her again, before Brainiac 5 uses a device that proves there is none of the Guardians’ energy, which would indicate the presence of the immortals, in the vicinity. Laurel steals the device and uses it to head back to the Himalayas and a city that, she determines, the immortals may have lived within once, but have long since departed. As the Legion arrive, she admits she has waited too long to have any part in the Millennium event and self-destructs. At the Green Lantern Citadel, Herupa Hando Hu and Nadia Safir tell the story of the origins of both the Guardians of the Universe and the Zamarons, to the Chosen. The tale takes them from Maltus, through to the split between the races; to Krona’s experiment that unleashed the anti-matter universe; to the founding of the planet Oa; the creation and rebellion of the Manhunters; the schism that gave rise to the Controllers; the foundation of the Green Lantern Corps; their self-imposed exile from the universe; and the return of Herupa and Nadia to help the Chosen. 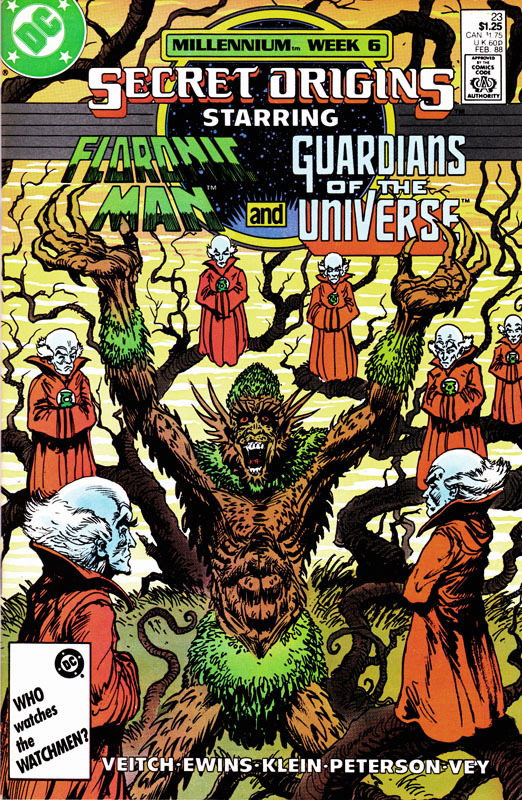 At Arkham Asylum, Killer Croc tells of the origin of the Floronic Man; his early experiments and battles against the Atom; his transformation from a man into a plant creature; his joining the Secret Society of Super Villains; his connection with the Swamp Thing; before his selection by the Guardians as one of the Chosen. A young Jamaican woman, Maria, is captured by Baron Blitzkrieg and his Nazi soldiers before they are attacked by Green Lantern Alan Scott who is attempting to rescue Maria. Lantern is overcome and the Baron plans to take both captives to his U-boat moored off the island. 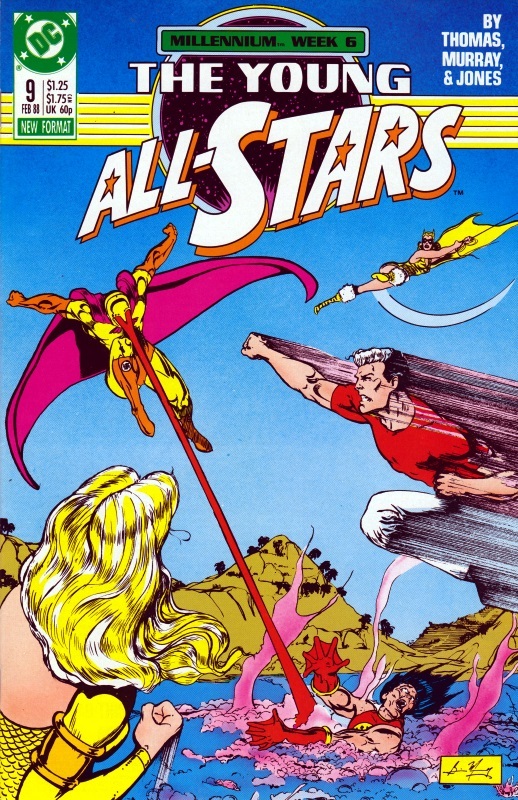 The Young All-Stars, tracking Green Lantern, arrive in time to prevent the Baron getting his captives on the submarine, ultimately forcing him to destroy his own U-boat in order to cover his escape. With that done, they capture Green Lantern who has no memory of freeing a Japanese POW, nor terrifying Inuits (as seen in YOUNG ALL-STARS #8 in Crossovers Week 2), nor why he had to rescue Maria. Upon returning to the All-Star Squadron, the Spirit of the Green Flame that inhabits Green Lantern’s ring, tells the heroes that it had mind controlled Lantern into performing those deeds as each of the people saved were ancestors of three of the Chosen who would have died had the Spirit not saved them.